The Daniel M. Soref Planetarium is offering an astronomy course for adults! This event is sold out. Please check back for our Fall 2019 dates. Do you want a deeper understanding of the universe? Join us for a five-week course and discover what the night skies hold. 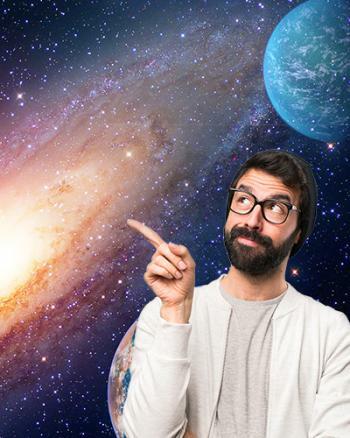 This engaging and interactive introduction to astronomy provides an understanding of the planets, stars, constellations, and more, and is suitable for adults 18 years or older. MPM Planetarium Director Bob Bonadurer brings stargazing alive through the use of 3D virtual reality media and telescopes (weather permitting) to provide an overview of astronomy and an exploration of the night sky. The class will explore the cycles of the Earth: its rotation, orbit, and how it affects the day and night sky. The motions of the Moon and planets will also be examined. See physical features of all the planets, including their geographies and atmospheres. A numbers of Moons, asteroids, and Kuiper Belt objects will be explored. Examine the history of eclipses and how they have changed from evil omens to celebrations of a rare alignment. Geometries of eclipses will also be studied. This class will take a closer look at the life cycles of stars -- how they are born out of vast nebulae, and how they die after their nuclear fuel is exhausted. How did the universe begin? How will it end? How do black holes fit into these questions? Explores these big questions in our Planetarium.